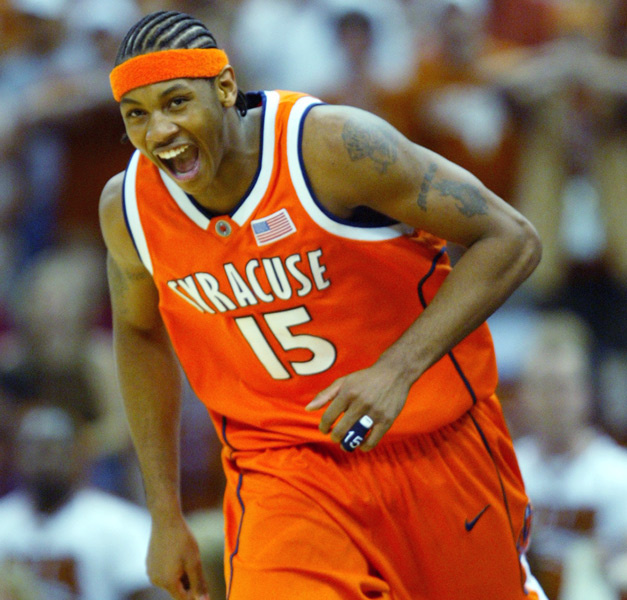 Carmelo Anthony only played one year of college hoops. Granted, one was sufficient to secure a national title, but it was one magical season nonetheless. His storied season was elevated when he scored his career high in the national semi-final against Texas. The Orangemen leaned on their freshman phenom and Anthony did not disappoint. Perimeter shooting, backing down defenders in the post, the tournament had not seen a freshman with such an advanced arsenal of offensive weaponry in a generation. Unfortunately for the Longhorns, they wound up up on the business end of Anthony's most prolific offensive outpouring. Call it what you will. 'The game that started it all.' Or possibly, the 'TV game.' Whatever you call it, remember to see past the influence of television and commercial advertising. Yes, this game played a pivotal role in propelling the popularity of college basketball and the tournament in particular. So...seeing past the hoopla of TV requires one to ponder the performances on the court. One performer stood out as a man amongst boys. Mr. Kareem Abdul-Jabbar (at the time Lew Alcindor) delivered an iconic performance for the ages. He was equally dominate on defense as he was on offense and unfortunately for Houston, there was no answer to solve the Abdul-Jabbar riddle. Fans of college basketball aged 28 - 40 remember practicing turn around jump shots from the top of the key with an imaginary clock running out of time. This was a daily ritual sparked by Laettner's last second shot against the Wildcats. His shot instantly became a part of basketball lore. But Laettner's performance on that day should not be summed up into one play. He was brilliant from opening tip to the iconic last second shot that sent his Blue Devils to the championship. Laettner attempted double digit shots and was 100% from the field. He also attempted double digit free throws, and was 100% for free throws in the game. This was truly a clutch performance for the ages. Ervin "Magic" Johnson controlled every aspect of the game from beginning to end. His combination of height, athleticism, and ball handling proved too much for the Sycamore's to muster a viable defense. While the Larry Bird rivalry was initiated in this game, this game should be considered Magic's coming out party. Magic's performance against Indiana State was brilliant and he remains one of only two players to record a triple double in the Final Four. All time single game GREATEST performance! Bill Walton's long bright hair constantly looked aflame. On that day in 1973, Walton played like his hair was on fire! His scoring efficiency is often undersold, as he was one basket away from finishing with 100 percent efficiency. Either way, sinking 21 of 22 shots is impressive! Snagging 13 boards while drawing more attention do to the accumulating points is even more impressive. As the bodies in the paint increased, Walton's aptitude for competitiveness and scoring prowess also increased. Memphis stood no chance against this giant. But observing his performance objectively, no person playing on any team in the country that night could have stopped Walton from scoring at will and imposing his will on the boards.